You can download the sample and rules for the article by clicking on the link below. When drafting an article, it is recommended that you edit the design sample directly, replacing the content of the sample with your information. Attention! Together with the article, the authors must send a scanned expert opinion on the possibility of publishing the work in the open press and reviewing the article! All articles are checked for illegal borrowing! The template of the expert conclusion is given as a reference sample. It is recommended to use the form of an expert opinion adopted by your organization. The review must include the position, academic degree and title of reviewer. The direct supervisors of authors and employees of structural subdivisions of authors can not act as reviewers. Within 3 days after receipt of the article by the editorial staff and in the presence of scanned copies of the expert opinion and review, the article is submitted to internal one-sided blind review. Simultaneously with the transfer of the article to the internal review, the authors receive an appropriate notification by e-mail. The maximum period for internal review is 14 days from the date the authors are notified about the direction of the article for internal review. 1. The article can be published. In this case, the article is published in the nearest issue of the journal, subject to the deadline for submission of the article indicated on the site s-sibsb.ru. 2. The article can be published after revision (the reviewer lists remarks to the article). In this case, the article is reviewed again after the author(s) has eliminated comments on the article and sent a revised version of the article to the editors. 3. The article can not be published. In this case, the article in the journal is not published, and the author(s) receive a motivated refusal. The publication of articles for all authors, including postgraduate students, is FREE OF CHARGE. Each article is assigned an international DOI digital identifier. 1. Gives its consent to corrector corrections to the article necessary for its publication. Such editing in this case should not entail changes in the meaning of the article, its reduction or inclusion of additions to it, supplying it with any explanations, comments without the consent of the author. 2. 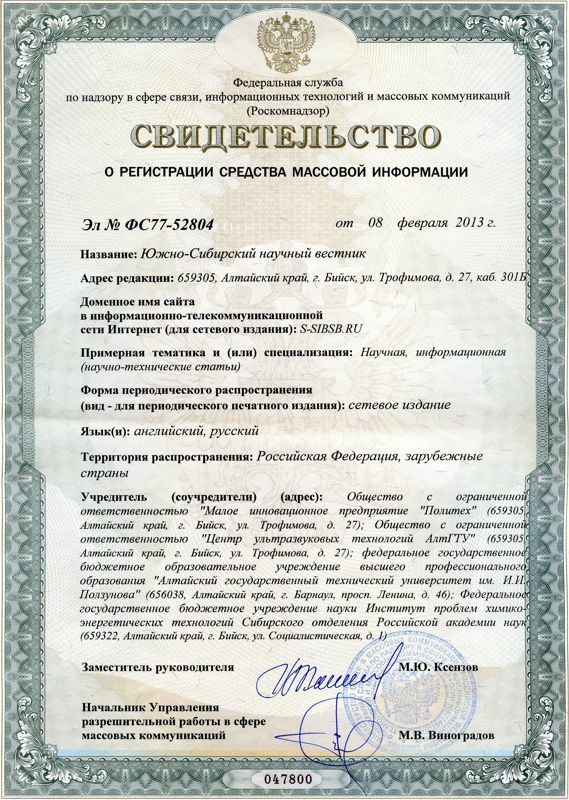 Gives its consent to the commission by the publisher of the journal and by persons who have the right to use exclusive rights to the magazine "South-Siberian Scientific Bulletin", any actions aimed at bringing my article to the public, including its reproduction, distribution as part of a composite work ( magazine "South-Siberian Scientific Bulletin"), and separately, posting on the Internet, inclusion in electronic databases, as well as free transfer of these rights to third parties, subject to compliance with non-proprietary copyright rav (including the rights of authorship, the right to a name, the right to inviolability. 3. Agrees to extract the metadata (name, name of the author (copyright holder), annotations, bibliographic materials, etc.) from my article and use them for inclusion in the RINC (Russian Scientific Citation Index) database containing bibliographic information (bibliographic description of articles and site references).